There’s nothing I love more than a good “Success Story”. It’s why I’m a sucker for those weight loss shows and Shark Tank stories. They just make you feel good inside, right? Let me tell you, though – the BEST success stories come from the people that I work with directly. Whether it’s Shark Tank successes or Virtual Assistants posting their “win’s”, the problem usually is, we don’t know HOW to get there ourselves. We see the success story, but we don’t get to see behind the scenes and know what it took to make it happen. That’s why I want to pull back the curtain today and show you the EXACT steps that I lead my Virtual Assistant clients through to start gaining more clients for their business. 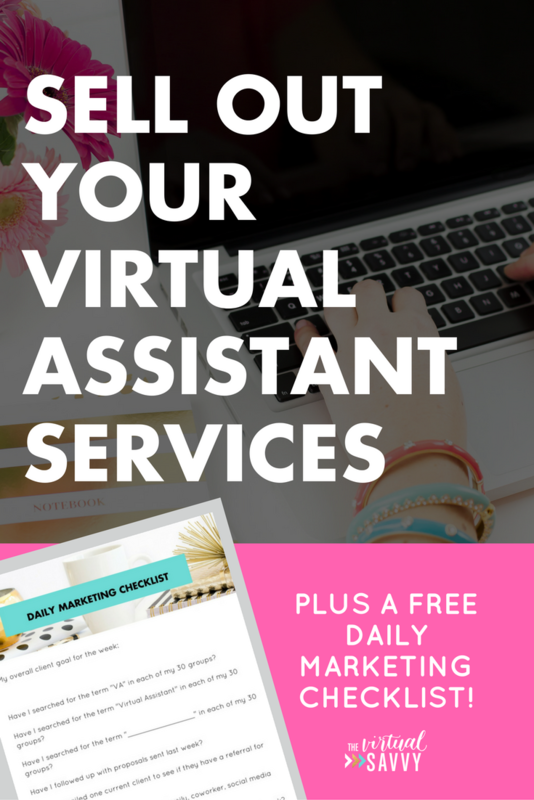 Ready for a step-by-step, detailed marketing plan for your Virtual Assistant business? You’re in the right place. Your clients are NOT going to come to you. At least, not at first. When you first start your virtual assistant business, no one knows who you are or what you can do for them. If you want to start getting clients for your business, you are going to have to go out and GET them. Let’s talk about each of these super-quick. You aren’t confident in your own abilities. You became a virtual assistant for a reason. Most people who start virtual assistant businesses have some kind of administrative background. You have been in a supporting role in the past, you have techie skills, or have some other skill that originally made you think, “Hey, maybe I can do this!”. Hold on to that. Gather testimonials from friends and family that say, “This girl is incredible. You should hire her now”. It’s okay if you haven’t had a client. You have skills to offer and the ability to learn. You ARE worth hiring. Know it. Believe it. Gather a few stories from others so you can remind yourself and your future clients. You don’t have a plan of action. That’s when it’s time to ask for a little help along the way. 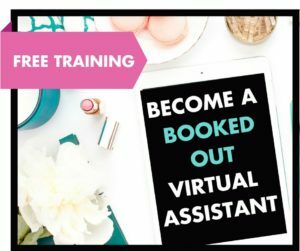 You don’t have experience selling out virtual assistant services. So, you need to ask help from someone who has (ahem… that would be me : ). Here’s the four-piece marketing plan I’m going to be sharing with you today. Take notes, this info is legit. Let’s jump into each of these, in detail. What is the most important part of a virtual assistant business? A time-tracking system? No siree. Earth shattering, right? Seriously though. If you don’t have clients – you won’t make money and you won’t HAVE a business. That’s why it’s so important to have marketing as part of your daily schedule. I recommend having at least one hour a day set aside for marketing your business. When you are first starting out – increase that number as much as you can. Spend 3, 4, 5 hours marketing your business. It’s the one thing that will actually yield a return. So, go ahead – right now – and decide when you will spend time marketing your business. Put it in your planner, or it won’t happen. When will you carve out time in your day to market your business? Don’t move on to the next step until you’ve done this. Or else, you won’t actually make it a priority! 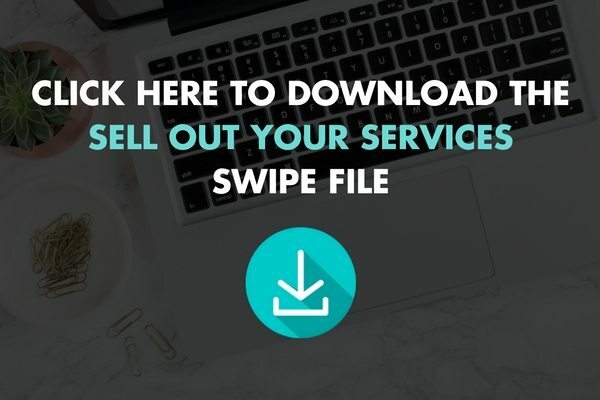 This is seriously one of the easiest ways to start finding clients, that most virtual assistants (and other business owners, for that matter) tend to skip over. You may be thinking, “Abbey – my friends and family don’t need a virtual assistant”. First off – MAYBE THEY DO! Second – MAYBE THEY KNOW SOMEONE WHO DOES! Even if your Aunt Silvia isn’t a business owner, I can guarantee she knows a business owner, and would likely be happy to send your information along to the right people. This list is easier to find than you may think. Start an excel spreadsheet (I even made one for you HERE) where you can list out the people you plan to reach out to. First, list out your family. Then, go through your list of friends on Facebook, your followers on Twitter and Instagram, your connections on LinkedIn. Who are you already connected with? Lastly, go through your email and look at the people that you have emailed in the last 6 months. How many of these individuals could you add to your list? Yes – this is going to take time. But you’re here because you need clients, right? If you don’t have the email address of the person you want to reach out to, simply send them something similar via social media. Even better, give them a call and have a conversation about what you are doing. The goal is to GET OUT THERE. Let people know what you are doing so they can support you. Remember, these are the people that love you and believe in you already. LET THEM support you! You’ve sent out your email to 50+ people. Some of them you may get responses from and some of them you may not. I recommend setting a reminder for yourself to reach out to these individuals again in a week. It’s not being pushy. Most people just forget to get around to stuff like this – so a reminder email will help them tremendously! Facebook is the #1 spot where I found my clients for my Virtual Assistant business. It’s where online entrepreneurs are hanging out, and where many go to first when they are looking for their own VA.
Here’s how to make Facebook groups your new best friend. This is easier than you may think. There are literally thousands of groups that entrepreneurs are hanging out in every day. These people are growing their businesses and are prime candidates for hiring a Virtual Assistant. I would recommend sticking with groups that have 1,000 members or more. These groups generally have more involvement and you’ll be casting out a wider net when trying to find people who need a VA. Remember how you set aside an hour a day for marketing? This is where the majority of that time is going to be spent when you are first starting out. You’ll go into your groups each day and search for the term “VA” and “Virtual Assistant”. You might even want to add “Social Media Manager”, “OBM”, and “Online Business Manager” to your list. Once you’ve searched for this term, you’ll see all the times that a member of the group has searched for that term. Oftentimes, the individual will be posting that they NEED a VA. This is your time to comment on their post and send them a personalized proposal. Many people avoid posting in Facebook groups because they don’t want to appear “sales-y”. However, showing up in groups on a regular basis (posting 1-3x per day) can be one of the BEST ways to find clients for your virtual assistant business! When you post regularly, people will begin to notice you and will be curious about the services that you offer. In fact, I recommend prioritizing posting in Facebook groups regularly over posting on your own Facebook business page! So… what do you post about? 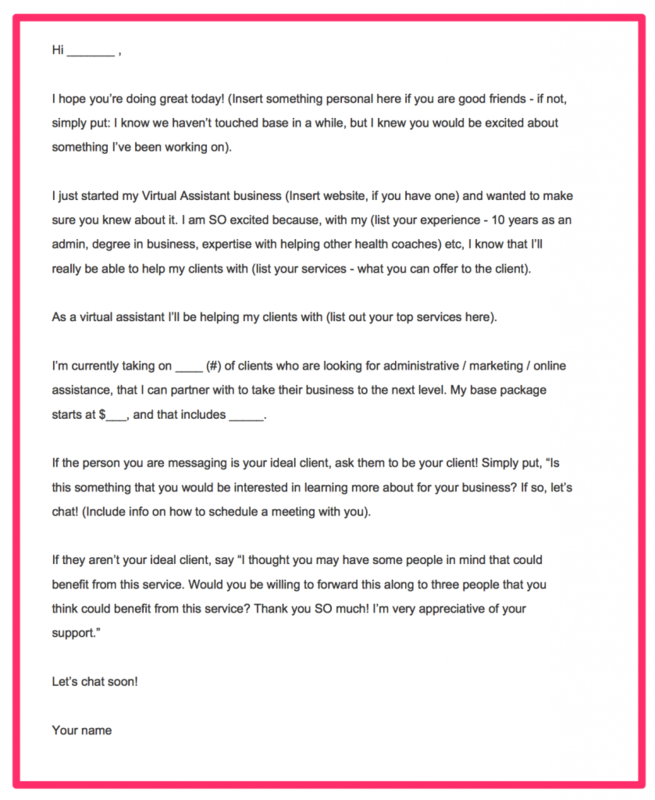 I’m about to share with you the SECRET to finding clients for your virtual assistant business. This is seriously the #1 way that you will stand out from the crowd and start getting clients for your VA Business. It’s ALL about the proposal. Remember how you’ve been searching daily in Facebook groups for the terms “VA” and “Virtual Assistant”? Once you find a person looking to hire a Virtual Assistant, the game isn’t over. Chances are, there are going to be other virtual assistants vetting for the same job. A few weeks ago, I hired a virtual assistant to help me out with a few tasks and I got 35 responses. Yep – 35. That’s a LOT. If you are going to stand a CHANCE in getting that job, you’re going to have to stand out. Before you get scared, let me reassure you. Standing out doesn’t mean having the most polished website or even the most experience. It means going above and beyond in your proposal. What does a BAD proposal look like? Seriously. So bad. But it’s what I see VA’s doing time and time again. By submitting this kind of “proposal”, you are leaving all the work in their hands. You may still get jobs if you have a really stellar website, but I guarantee you won’t make people say “WOW” with a proposal like this. Let the potential client know that you will be sending them an email or private message, but then spend some time researching their business. Take time to read who they are and what they offer. What have they posted about previously in this same Facebook group? What do you like about their website or the programs they offer? What do you see immediately that you can help with? You’ll only know this by taking the time to research them. When you email your client – make sure to give them a compliment on what they are doing or tell them what you like about their products. Is there anything that connects the two of you? Maybe you grew up in the same state or have the same kind of dog in her profile picture. Find a way to connect and make it personal. What if you took an extra 30 minutes to SHOW your potential client what you could do for them? In addition to sending them a general portfolio of your work, is there a way that you could show off your skills for their business personally? Give value: Lay out a personalized plan of the exact steps you’ll do for them to increase their followers and engagement. I’m telling you – people aren’t doing this. It takes time. It takes you doing work without getting paid for it *Ghasp!*. However, if this is a client you really want to work with (which you’ll actually know since you’ve done your research), isn’t it worth it to take time to make sure your proposal gets noticed? Building a business isn’t easy. It will take work. It will take waking up early and saying “no” to other things. 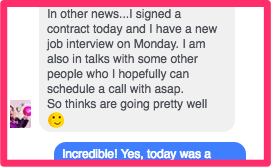 However, when you land your first client (and then another… and another… and another) it makes the hard work 1000% worth it. What are you going to today TODAY to grow your Virtual Assistant business? I’ve read post “like this” everywhere, but there are so many things I hadn’t heard before. Great “timely” information. Thanks for sharing. Thanks Vittoria! Glad you liked it. Is there a method that you’re going to try? Great Ideas. Thank you for sharing. I did not know until now how to use FB properly when it comes to groups. I love this! And it is useful for all sorts of work, not just virtual assisting. I can specifically see a lot of this working for freelance writers as well. Thank you! I am so glad that you liked it!!! I love the process! It’s going to be my new years resolution, thank you for sharing ? Awesome! Thanks for sharing. Make sure to let us know how it goes! Hi Abbey, thanks for sharing this! I’m confident I’ve got awesome admin skills, but I have no – zero – zilch -marketing background. This article was very helpful – after reading dozens of “make your VA business a success” style articles this one had some really useful tips I’ve not previously heard. I’m new to Facebook and have heard it can be useful for networking to get clients, but had very little idea HOW to use it for that. Your specific steps for that sound really useful. Look forward to giving them a go. I feel like a new VA!! This is stuff that I have not learnt before, from many other coaches. But, I am super excited to get going….seriously. Thank you so so so much Abbey!! No problem Evah! Trust me I am always learning new things! This post was awesome!!! I love your website. Thank you so much for this post. I am a new VA, and have been trying to figure out how to get clients for my author services business. I can’t wait to print out your check list and fill it out. We are so glad you liked it! Thanks for the feedback! This post (like ALL of your others) is so helpful! Have you had any students who were writers do this successfully? I suppose it can’t hurt. Competition is steep everywhere in freelancing. Maybe it’s more about going the extra mile like you talk about in the post, and not really significant which way I market myself. Hmmm. I could always start marketing myself as a VA and pivot over to writer later. ?? I totally get where your coming from. I say embrace what your good at and market yourself as a copywriter. The more specific the better. It’s all about going the extra mile so you can stand out. Abbey, This is really great and helpful. I am working as a VA from past 2 years but always thought on some strategies on how to sell. I am gonna follow these now. Thanks again. Thank you for this. I definitely need to stop lurking in groups and be apart of the community. Glad you liked it, Elisa! Hello there! I am a new VA and I’m having some trouble. I want to market my services to local small businesses, but they aren’t currently asking for some help. I want to email them a pitch, but I don’t know how to word it properly. What would be the best format to look professional when emailing local businesses? Thank you so much for this, Abbey. I learned a lot, and plan to apply it immediately. I am starting out to become a VA. This website is by far the best I have read. Thank you for the advice and honesty. Another great read thanks to you Abbey! I am always amazed at how you are able to write and make your readers feel that they are just talking to a friend. Could you write about how to use job boards to find work? What is the process? Are there best job boards to find work? What should we say in our outreach to the business owner? Should we call or email and what would an email say? Wow, I am not a VA but these rules can apply to any business. Great free guide. This is genius! I have been feeling very overwhelmed with everything that goes into making this business work. Everything you provide has such value! Awww, that is so sweet of you to say, Brianna! Thanks for stopping by the blog! Great post. I love your blog by the way. I am new the to VA world. Haven’t officially started but highly considering it since I have the skills and love virtual work. It would allow me to stay home longer with my boys. I have no problem doing the work, but my question is when you go above and beyond do you somehow brand the suggestions so they don’t just copy and paste or do you give it to them for free? When you’re pitching potential clients, typically, we recommend that you give something away completely for free, with no strings attached. If you’re worried about people stealing your work in the future, try and create something that is specific to that (potential) client–a branded graphic, short blog post, etc. Hi Abbey! Thanks for sharing this. This is really helpful specialy for someone like me who was just starting in VA Business. Glad to help, Anne! You can do this! I’ve enjoyed your blog very much and forwarding it to my nephew who recently just started his own Virtual Assistant Business! You are very detailed and easy to understand! Thank you. Thank you, Cathy, for passing this on! Our goal at The Virtual Savvy is to help aspiring VA’s to find their niche and be successful! Best wishes to your nephew!